Using a 10 mm socket hexagon wrench, remove the rear differential filler plug and gasket. 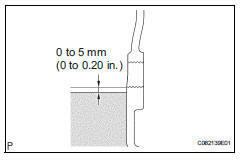 Check that the oil level is between 0 to 5 mm (0 to 0.20 In.) From the bottom lip of the differential filler plug hole. After changing the oil seal, drive the vehicle and then check the oil level again. If necessary, fill the differential carrier assembly with hypoid gear oil. Using a 10 mm socket hexagon wrench, install a new gasket and the rear differential filler plug.